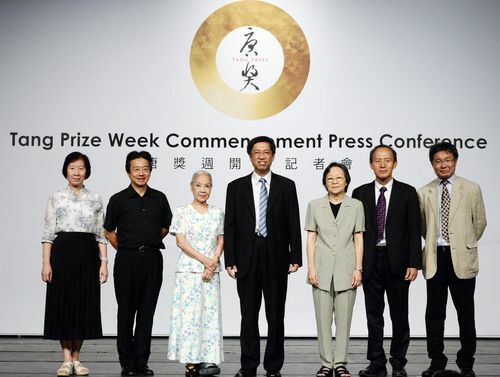 Taipei, Sept. 4 (CNA) The first Tang Prize award ceremony will be held Sept. 18 in Taipei and will be attended by the five laureates -- international leaders in their various fields -- and representatives of more than 30 countries. At the award ceremony at National Sun Yat-sen Memorial Hall, the Tang Prize laureates will each be presented with a medal and certificate, according to the Tang Prize Foundation. The laureates are Gro Harlem Brundtland, former prime minister of Norway, who won the prize for sustainable development; James P. Allison of the United States and Tasuku Honjo of Japan, who is sharing the prize for biopharmaceutical science; Chinese American historian Yu Ying-shih, who won the prize for sinology; and Albie Sachs, a former justice of the Constitutional Court of South Africa, who was named the winner of the prize for rule of law. The laureates in each category will also individually receive or share (if there is more than one winner in the category) a cash prize of NT$40 million (US$1.34 million) and a research grant of up to NT$10 million to be used within five years. Foreign ambassadors and representatives from over 30 countries are also scheduled to attend the ceremony, Tang Prize Foundation CEO Chern Jenn-chuan said Thursday. Amid speculations that the awards will be presented by President Ma Ying-jeou, Chern declined to name the presenter. In addition to attending the award ceremony, the laureates will give talks on their life's work Sept. 19 at the Taipei International Convention Center and participate in forums around Taiwan to interact with the country's youth and the general public, according to the foundation. Brundtland will speak at National Sun Yat-sen University in Kaohsiung Sept. 17; Yu will take part in a forum at Academia Sinica in Taipei Sept. 20; Sachs will give a lecture at National Chung Hsing University in Taichung Sept. 20; and Allison and Honjo will speak at National Cheng Kung University in Tainan Sept. 21. The organizers said members of the public can register on the Chinese-language website http://www.tang-prize.org/signup/ to attend the lectures free of cost. The Tang Prize Week, from Sept. 15-21, will also feature a concert by the Taiwan Philharmonic, a reception, a banquet and two exhibitions. One of the exhibitions, being held Sept. 1-28 at National Chiang Kai-shek Memorial Hall, showcases the lives and works of the laureates, as well as entries from the Tang Prize Medal and Diploma Design Competition. The other exhibition will be held at the National Palace Museum (NPM) Sept. 5-28 and will display selected NPM paintings and calligraphy from the Song Dynasty and Tang Dynasty -- from which the award takes its name.